Light in the darkness. Flickr photo by Len Radin. Shorty’s bagels. Photo courtesy of Shorty Goldstein’s. 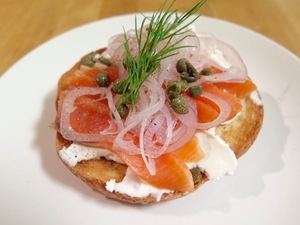 You know you want it: the new bagels at Shorty Goldstein’s, here with schmear and gravlax. Photo: © tablehopper.com. Hanukkah begins at sunset on Sunday December 6th, and lasts until Monday December 14th, and there are plenty of ways to celebrate with light, fried foods, and more. First, ~SHORTY GOLDSTEIN’S~ is celebrating the season with some Friday night dinners this month, on December 4th, 11th, and 18th. Each of the evenings will feature a seven-course tasting menu, with what owner Michael Siegel calls “fancified Jewish food” (so, not their usual deli fare, though pastrami will make an appearance), along with wine and beer pairings. You can check out the menus right here, including a fun “Jewish Christmas,” Chinese food-inspired menu on December 18th. Seatings are at 8pm, and tickets are $96 per person, including food, beer, wine, and a service fee. 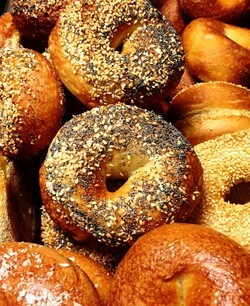 Also, news flash: Shorty’s is also serving freshly baked bagels every morning (you lucky FiDi workers, you!). The bagels are pulled out of the oven at 8am and are available with schmear, gravlax, or as breakfast sandwiches (there’s one with pastrami, cheese, and egg, in case a holiday party put the hurt on you). You can get all the classic flavors (plain, poppy, sea salt, everything, sesame), but what’s unique is how he’s doing the onion bagel—instead of the onion getting burnt on the top of the bagel, Siegel mixes it in with the dough (and now the top and bottom halves are both delicious). Look for more flavors coming soon, like caraway and pumpernickel. There is a limit of six per person, but you can order 24 hours in advance if you want to style your office with some really flavorful, chewy, golden bagels. Siegel has been working on them for the past three months, and you can really taste his handiwork on these! And last but not least, don’t forget that Shorty’s offers Hanukkah catering options to make the holidays just a tad easier. 126 Sutter St. at Montgomery, 415-986-2676. 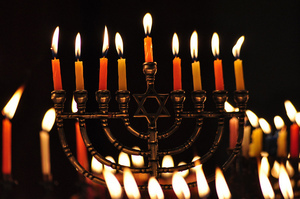 ~COMAL~ is hosting two “Oaxanukkah” dinners during Hanukkah, on Monday December 7th and Tuesday December 8th. They both begin at 6:30pm, and the menu includes dishes inspired by both Oaxacan and Jewish food traditions. Look for braised brisket with ancho chile adobo, carrots, and raisins, and buñuelos with bitter orange marmalada. Tickets are $70 per person and include food and tip; beverages will be available for purchase. Chef Jeff Banker is offering a few special Hanukkah classics at ~BLUESTEM BRASSERIE~, available only on Thursday December 10th. You’ll find latkes and braised brisket on the regular menu, as well as matzo ball soup.